Well, I have yet to get into a good groove with my blogging habits since about forever ago! 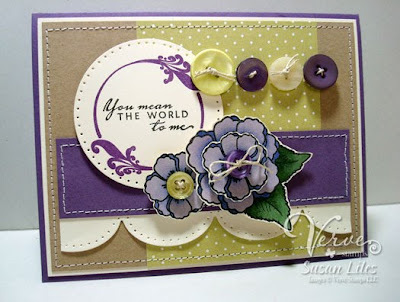 It seems when you don't do much stamping, you don't have that much to put on your blog. Go figure. However, that's all about to change. 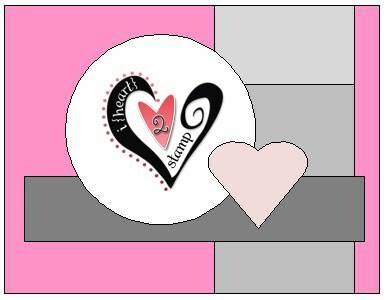 Next week will be one of my busiest stamping weeks in a long time, so stay tuned, as I'm ramping up to lots of eye-candy to share! Who knows, maybe I'll go crazy and even have a give-away! Anybody want a button? I'm so excited! So of course it's Saturday and that means it's time for Jen's Sketch For You To Try. I really like this one and it made this card come together fairly quickly! I had not played with my Verve stuff in a while (sorry Julee! ), so I was itching to use this set, One Person (which happens to be on sale through Monday!). As usual, I had colored these flowers quite some time ago during one of Eric's long chemo sessions, so they were even cut and ready to go (well, all I had left to do was spray some Shimmerz on them)! I think these would be so pretty to make a set of, and use some of the different sentiments that come with this stamp set inside the flourished circle. To save time, you could even leave off the flowers and nix the stitching for a simpler look. OH and how about that big ol' scallop border? It's made with my new Die-Namics die from My Favorite Things. Ooh-La-La! It cuts like buttah!! You can't leave that off. Because I said. I'm bossy like that. 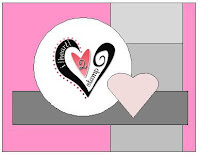 SUSIE Q-TIP: It's a bad idea to spray Shimmerz Spray over something you stamped with a DYE INK such as Stampin' Up (or any other brand for that matter--it's too risky). It makes the ink run. Don't ask me how I know this. I don't want to talk about it. This is really lovely girl. I love purple and don't use it enough! I had to laugh about the comment about no stamping equals nothing to put on your blog. I am so with you. I love, love, love this card. The colors are beautiful and all of the details are just perfect. Oh, wow! Susan, this is just gorgeous!!! 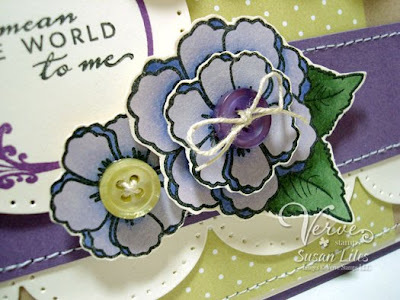 I love the colours, the buttons, the paper, and the flowers...everything!!! ACK!! This is very pretty! I love your flowers. I love all of the buttons and the colors of them are gorgeous. They perfectly compliment the flowers. This is a fabulous use of the sketch. Gorgeous work, Susan!! love it!! OMG...THAT ROCKS!!! I love ONLY typing susiestampalot.com...with no blogspot...HOORAY!!! It's about time!!!! It's TOTALLY WORTH IT ALREADY...don't ya think!!!??? Auto-renew is the WAY TO GO!!! !